Restaurant dining expectations are evolving. At one point, going out to a fine restaurant was a good way to practice your etiquette skills. It used to be that most sit-down restaurants had an early and a late seating, depending on the hours they were open. Now, many just try to move as many tables as they can. We have to remember that restaurants are businesses. And businesses must be profitable. But there is a need for propriety, which occurs when there is an understanding built through a system of etiquette. Communication between patrons and wait staff is essential to a pleasant, and proper, dining experience. Here are some expectations – from an etiquette standpoint – of both the diner and the restaurant. One primary etiquette guideline when dining out with other people is that everyone should have drinks and food at the same time, matching drinks and courses. For example, if your dining partner orders an appetizer or salad before the main course, you should have one (or something comparable) as well. Treat the wait staff with respect. Be understanding if your order is incorrect, or you notice a shortage in staff causing your service to be slow. And remember, “please” and “thank you” are never unappreciated. It is okay to give the wait staff an idea of the time you will spend dining. You can mention that you’re meeting an old friend and will linger a while to catch up. Or you’re stopping in for a quick bite on your way to the theater. If you drop a utensil or your napkin, ask your waiter or waitress for a replacement. When there is a definite issue with your food order and it needs to be sent back, handle it quietly. No need for drama. 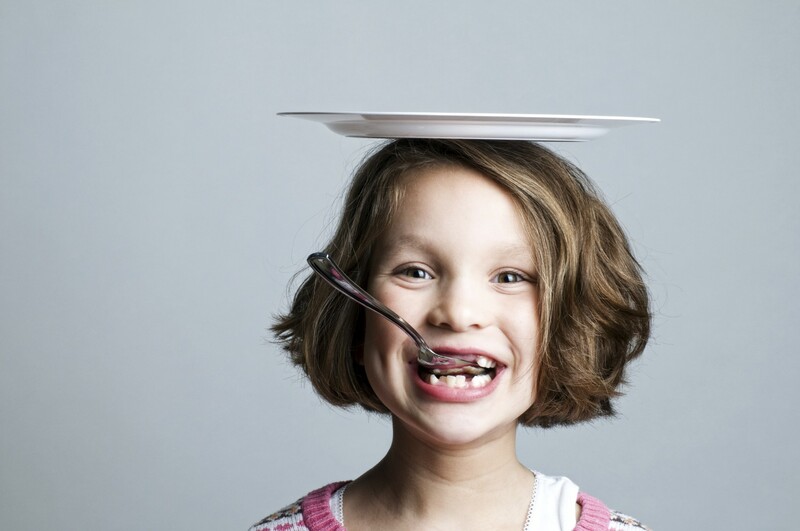 If you are dining with someone who has sent a dish back, refrain from eating until the plate is returned to the table. Your dining partner will likely ask you to continue eating, but keep a very slow pace. Avoid putting table trash in glasses. Paper napkins, straw wrappers, etc. are placed on your bread plate or left on the table. No one wants to wrangle trash out of glasses before they go into the dishwasher. Let your waiter or waitress know as you are ordering if there will be separate checks for the table. Tip generously. If you received a discount on your meal, be kind and tip on the original amount. You may be getting a price discount, but the same amount of work went into preparing and delivering your meal. Always smile and maintain a pleasant demeanor. Food service work is not easy, but it’s best to keep this a secret from diners. Ask if diners would like to hear about specials before launching into a sales pitch. If your restaurant’s procedure for delivering food to tables does not include a tray, do your best to hold plates on the bottom so patrons don’t have the impression your fingers have been in their food. Also, hold drinks as close to the bottom as you safely can. 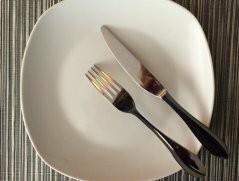 Before clearing plates, ensure that everyone at the table is finished with that course. If a diner doesn’t seem to know the silent signal for closing out (see the photo at right), then ask if everyone would like their plates cleared. Unless you are asked for it, wait until the last round of plates are cleared before bringing the check. Teach yourself to understand what various diners need from you. A couple on a date may want more privacy. A group of people out for dinner and a movie may need more attention to ensure they leave on time. 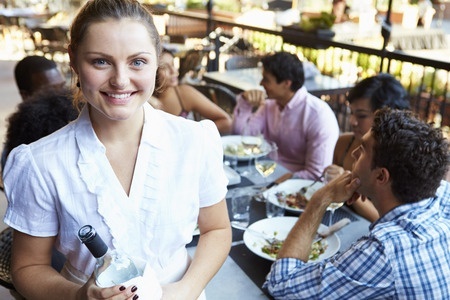 Remember, communication is key to having your restaurant dining expectations met. Whether you are dining or waiting tables, courtesy and understanding are the perfect side dishes for a pleasant meal.